This month's post is the final installment in a three-part series on the Montessori Approach to Literacy. Infants need to hear us speak, slowly and clearly, making eye contact. You’ll see the urgent ways they respond when their bodies, hands, eyes and mouths are all moving and quivering with effort as they prepare to make sounds that imitate yours. Give this process the time and value it deserves. What a complete miracle it is that we are born wired for communication and human connection! Opportunities for interaction happen when we are changing a diaper, breastfeeding, or feeding an infant with a bottle. It is so important that we not talk on the phone or text during these times, but give our children our attention and be present with them. Feeding is communication for an infant; it is a whole body experience involving the psyche, personality, and emotional relationship with food, as well as communication with their first human being. Do your best to be emotionally present for these times of interaction and attend to your own adult needs at other times (which you must do, too!). A tangent here: Although compartmentalizing our time is a constant challenge in our modern lives, the consensus is that compartmentalizing and avoiding multi-tasking is the antidote to distractibility and stress. Doing this from your early years with your infants will set you up for your parenting life--it’s a marathon, not a sprint, so take good care of yourself! Young children need to converse with us. Model for your children by saying the real names of things and taking an interest in the world around you. Go with what is right there in front of you--our immediate world first, because it is from this base that the child will build her knowledge and understanding of the rest of the world. Taking the time to make eye contact and articulate as you are speaking with your children demonstrates to them that human relationships are your priority. So much speech development is taking place every single day when your children are young. Foster a family culture of sitting down to eat and converse together at meals. Studies overwhelmingly show the benefits of this habit. This is where our children pick up on your family’s values, manners, mindset, approach and attitude toward life. In addition, children gain strength from their family connections. This is where you get to check in with each other emotionally and learn about what your children are thinking about. It is also important to remove obstacles when they are spotted. Ask your pediatrician to check your infant’s ears for hearing and their tongues for speaking, for both are critical to the process of forming speech and comprehending others. Because language development is so sensitive, do not hesitate to get professional help if it is needed. It is not a big deal to get help from a speech therapist for a few months if your child needs the extra guide. Most children don’t need outside help, but if you have one that does, my advice is to move forward with early intervention because the younger a child is, the shorter and more effective the therapy will be. 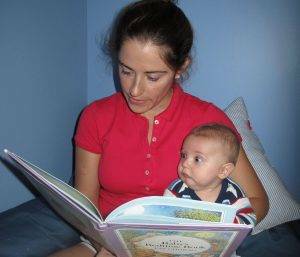 Children of all ages need to see us reading for pleasure and hear us reading out loud to them. Because they are naturally hardwired for language, so much of “teaching” children to read, think, and communicate comes quite unconsciously and naturally by listening to us read. Interestingly, studies show that there is a difference between listening to a recorded voice, even if the child can see the face on a screen; being with a real reader and interacting with that person is far superior to just listening to a voice. So, while audio books are nice on a long drive or to entertain a sick child, they are not an equal replacement for read-aloud time. Sit down together to read to your children regularly or whenever you can. Allow your children to hear you articulate words while they follow along with your thoughts and absorb sentence structure, vocabulary, and ideas from listening to you read. This is also where deeper conversations and more intimate subjects often come up in conversation. If you read from the classics with older children, choose books you love. When hunting for books, look at the illustrations, culture, sounds of the language, structures in the sentences, and the vocabulary. Nurturing a love for reading and writing sometimes takes until the teen years to accomplish, so do not be discouraged if you have a child who would rather dribble a ball, play with dolls, or dig in the mud. The stories and words we share with our children fuel the dialogues they create and revisit in their quiet minds while they are off playing alone or with others. 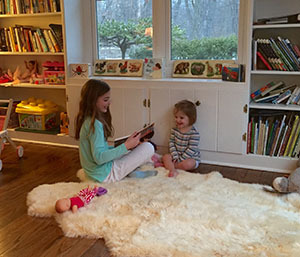 Surround your children with books, paper, and pencils and “ooh and ahh” over their little written stories, drawings, and other gifts of language. This evolution of one’s language is a natural process – and a magical one to be enjoyed.